“Garland of Flowers” is Jonathan Fox’s recent account of working with a Playback project in Nepal, a country where he spent two formative years as a young man (referred to in his memoir Beyond Theatre.) Returning to Nepal in 2016 brought new understanding of how his long-ago experience there contributed in important ways to the formation of Playback Theatre. Jonathan is the founder of Playback Theatre, the author of Acts of Service: Spontaneity, Commitment, Tradition in the Nonscripted Theatre, and the founder of the Centre for Playback Theatre, an international training organization. He holds a PhD (Honoris Causa) from the University of Kassel, Germany. February 2016: Exhausted after the 24-hour journey from New York, having survived the sudden storm as we approached the Kathmandu Valley, then finally disembarking into the gloom of an airport that had lost electricity, I staggered around in the darkness looking (in vain) for my suitcase, eventually wandering out into a shadowy hall to be met by a handful of beaming strangers bearing prayer scarves. Later, finally settled in a hotel room (with backup generator), I shocked myself by catching sight of my bleeding forehead in the bathroom mirror—when and how had I sustained this injury?—finally realizing that the red was not blood, but dye from a ceremonial welcome tika that I did not remember. That first day was a day of meetings—drinking tea and discussing the playback theatre project run by by the Berlin Centre for Integrative Mediation (CSSP) and Pro Public, partnering NGOs from Germany and Nepal. Traveling by taxi from one place to another I glanced at a city transformed—ten times bigger than I had known before, choked with cars and motorcycles, with pedestrians wearing facemasks against the foul air and litter everywhere. Time had not been kind to Kathmandu. Entitled EnActing Dialogue, the project was an ambitious attempt to use theatre for peace building. In the decade surrounding the new century over 14000 Nepalis had died in an armed conflict. The insurgents had made use of child soldiers. These excombatants, now young adults, were struggling to integrate into civil life. The EnActing Dialogue program involved “dialogue facilitators” acting out the stories of villagers using an interactive approach of which I was a founder. Hence my invitation to be a trainer. The goal was to encourage mutual understanding in the post conflict period. I had been a Peace Corps Volunteer in its early days, when the US government had not hesitated to send liberal arts graduates to teach technical subjects they knew nothing about, such as converting to modern agricultural systems. The assumption was that an educated, Western, American youth was so smart, so pragmatic, he or she could figure out anything. Of course I couldn’t. In actuality, despite three months of special training, I arrived in my assigned village in the flat, rice-growing region of Nepal called the Terai unable even to recognize the difference between planted wheat and rice. My ignorance made little difference, however, due to the dysfunctionality of the Nepali infrastructure and government. The improved seeds and fertilizer upon which my work depended never arrived in my region. There was nothing to do. For two years. That Nepal was the most isolated and poorest of all the countries to which the US sent volunteers did not help (we were well-off with a salary of $1 per day). Conditions were truly challenging. The weather excessively hot. I was the only English speaker for dozens of square miles, my handful of cohorts equally isolated. With no occupation, no nearby companions, and an absence of support from supervisors, my life in Nepal then was a kind of waking nightmare, which I only survived by dulling my spirit and kidding myself that things would improve tomorrow. 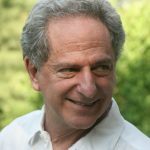 The ordeal of my experience and the absurdity of my mission had been the reason why, despite a career of traveling the world as the founder of a now widely-practiced theatre method, I had never returned to Nepal, even though I had long been aware that in some vague way my work owed its genesis to there. I had been loath to be a tourist and relive some of the gross disparities I had experienced in the 60s. 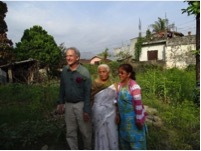 Moreover, I couldn’t get over my fundamental embarrassment that the US had plunked me down in a Nepali village and expected that I would transform villagers’ lives. Yet being back on the noisy streets of Kathmandu, buying sandals in a tiny, open-air shop and discussing the price in my slowly returning Nepali language, shaking my head from side to side to mean Yes the way Nepalis do, taking in colors and smells that had not changed in a half century, was exhilarating. Once more in Nepal! “Namaste!” I said to everyone in the hotel. I looked at the prayer scarfs my new colleagues had welcomed me with, now carefully placed across the back of a chair, and welled up with joy. I had waited a long time for a good reason to return, and it had finally come. Playback theatre is a more-than-entertainment approach that sometimes takes place in box office theatres, but mostly occurs in community settings. Its improvisational basis—the performers enact real stories of audience members—demands an attunement to each new place and each new group of people. Not unlike what I observed at festival performances in Nepal, where a village cultural event was affected by demands of weather and other local considerations. There was another, even more obvious, way that the discovery of playback theatre was influenced by my time in Nepal. Playback theatre’s nonscripted nature connected it to preliterary recitation, and my daily life in Sunwal village, surrounded by mostly illiterate neighbors, was nothing if not an immersion in a culture where every speech was a performance and stories could not stand independent of the persons narrating them. I had known something about this when I first arrived in Nepal, since I had learned about the oral tradition in my university days. Of course, there was a distinct difference between studying a subject (reading Gilgamesh in the library) and living it. The EnActing Dialogue project was organized in two tiers of participants. First were theatre artists from Kathmandu, who had learned the basics of playback theatre in order to instruct the locally-based dialogue facilitators, the mixed teams of excombatants and community members who would perform in villages in the post combat era. And come back to be told again. I was astounded. This little poem summed up my life’s work! I did not know “Bhannelaai.” But perhaps I had known it before, then forgotten? “Let us tell you about the name we have chosen for playback theatre in Nepal,” said the theatre artists. After trying out one name and another, they ended up hitting upon the correspondence between the chautari tradition and playback theatre. Chautari refers to spots reserved for travelers to rest and refresh themselves. In a mountainous country, often without roads between settlements, much commerce of all kinds was undertaken by foot. Villagers would plant a bal or pipal tree (sometimes both, then “marry” them in a special ceremony), and build a wall of stones around it for passers-by to sit on. These chautari, located throughout the country, in the flat Terai region, where my own village had been located, as well as in the hills, are known not only as places to rest, but also to chat, to relax, and share stories. Hence playback theatre in Nepal is called Chautari Natak, or Chautari theatre. When I looked back, there had been that big pipal tree across from my verandah. It must have been a Chautari! (I had brought a camera with me on my original sojourn, and I came across a note I had written early in my stay: “so far I haven’t taken any pictures here, but as soon as I feel comfortable, I will.”) I never did. So there is no photographic record of the pipal tree, or the mud hut I slept in, the public pump I bathed in, the house whose family I ate my meals with, or the people who stared at me as I went about the necessities of life. The teller’s face flushed, he watched intently as the actors portrayed his story. He was, in fact, a manager of the dialogue project, taking advantage of the chance to tell his story—the uncle who despite his considerable professional skills at organizing and getting things done, was helpless to save a member of his own family. His close colleague told me afterward that she was glad to hear him tell this story, since it had been bottled up inside him. The project hosts had asked me to carry out two trainings, one with the theatre artists, located high on a ridge in the Kathmandu valley with a spectacular view of hills and high mountains (where the project manager told his story), and the other, for a group of dialogue facilitators, in the Terai city of Butwal, in the heart of one of the former conflict areas. The training space for the first week was a light-filled room looking out over steeply falling terraced hills. On one side was draped a brightly colored cloth that waved in the breeze. It took the place of the wall that had been destroyed in Nepal’s terrible 2015 earthquake (signs of earthquake damage were everywhere, in crumbling buildings and roads—almost a year later the funds for restoration had reportedly still to be released). Despite the breeze blowing in from the open wall, it was a beautiful place to practice playback theatre. But as soon as we got down to work, I realized how new these actors were to the form, and how much learning lay in front of them. In sudden doubt, I reviewed in my mind the history of the EnActing Dialogue project. While Pro Public was the local partner, the impetus had come from Anne Dirnstorfer, a long-time Nepal peace worker and theatre practitioner with a history of working with the Theatre of the Oppressed. She had first encountered the playback idea from a foreigner in Nepal, but had learned more back home in Germany, where there is an active playback theatre movement. She had then enlisted a German playback practitioner and fellow peace worker to be her co-trainer in teaching the Nepali theatre artists a year before. The funding for the project, in fact, was coming from a German government’s foreign aid program channeled through CSSP, an organization devoted to international peace building, which had in turn invited the involvement of Pro Public. Was I being hoodwinked once again, just as when I joined the Peace Corps? My job now was to run two trainings. But trainings were often the Big Macs of international programs, easy to deliver, easy to consume, and often of little sustenance. (When I taught playback theatre in Burundi, another poor country dependent on handouts, I had learned from my students that they had had a storytelling workshop the week before my visit and a conflict resolution training the week before that.) “How much are people getting paid to be part of this program?” I asked Anne, knowing that in many cases the real reason locals participate is the stipend and the meals. “Only transportation,” she said, explaining her thinking that refusing to offer stipends was the only way to ensure genuine motivation. To know that the dialogue facilitators were volunteers, albeit carefully selected, reassured me. And as I continued to find out more from Anne as the days continued, I grew in respect for her sensitivity and ethics. Anne had been researching and working in Nepal over much of her adult life. She had long-term relationships with Nepalis, and knew the language and culture well. She cared about questions of sustainability and genuinely wanted to help build peace, goals that I shared. In our modern, superconnected world, how else should it be, I rationalized, than wealth being redistributed by gift as well as commerce? I reminded myself that in fact even in the developed world playback theatre rarely lives only from the market economy, but is sustained by grants and volunteering. 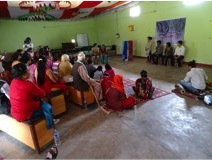 Although EnActing Dialogue called in foreign trainers to get it off the ground, from the start the goal of the program was to involve only Nepalis, and despite the performers’ recent exposure to the playback forms, villagers had unquestionably responded to the invitation to be tellers during the performances, even of their most serious stories. Even more important, their neighbors had paid attention. “Bhannelaai phulako mala.” Garlands of flowers for the tellers, and for the listeners, garlands of gold. I decided to hang in there, do my best, and keep my eyes and ears open. Even though the second training took place in a high-end hotel for Butwal, the meeting room was far from my usual standard. It was too long and narrow; the floor was too hard; and the temperature too hot (there was air conditioning, but only when the electricity worked, of course). But within a day, I adapted. I had had a brief taste of the resilience needed to get by from day to day in Nepal, where in my village life there had been no electricity at all, no running water, no sealed roads, and no way to keep rats out of my living quarters. I learned one did not need shoes to survive; or peace and quiet, or three meals a day; or indoor heating and cooling; or even clean water. Eventually I came to feel that there was comfort in living so close to the earth and its natural rhythms, a counterbalance to the claustrophobia of isolated village life. While the shadow of a colonialist pattern may have flickered over my new assignment in Nepal, my visit also represented a kind of homage. I felt thankful to the culture that had given me my lesson in hardship and inspired an idea based on creativity and courage. When I tried to recall details of my experience all those years ago, they were elusive. I knew I had taken my meals with a family, but had forgotten their name (and never written it down). I remembered they made me eat on their porch because I was not, like them, a high-caste Hindu. I don’t know how much I paid, but I do remember how meager the meals were. The young wife, who made the food, was kept out of bounds to me. And despite my extreme loneliness and a general love of kids, I knew to keep my distance from the five young girls in the family. I remembered that my arrival in the village had caused conflict, but not why. Something about the house (one-room mud hut) they had promised to build, then delayed, then overcharged me for. Had I been a pawn between political factions? The faces of my Peace Corps supervisors were still clear in my mind, but not my constant struggle to counter their neglect of me, as the months stretched out to my two years without meaningful work or any helpful intervention. It was so long ago. The EnActing Dialogue project, and playback theatre itself for that matter, is based on a belief that the narrativizing of identity is beneficial. In a case cited in project reports, a woman had told about losing her married sister when she was a child, then being wed herself to the same brother-in-law, a much older man. Soon after the wedding, this man was killed in the war. She was suddenly the sole parent of two step-sons. She spoke about her aloneness and her struggle to care for the boys, despite her original reluctance for the ill-fated match. The neighbors had been suspicious of this young woman. But after the enactment of her story, they had new understanding and decided to support her. Anne Dirnstorfer did not let go of the coincidence of the closeness of our training site to my old village. The Pro Public staff visited Sunwal. The local leaders readily accepted the idea of a performance. So on our last full day of the training we all climbed in a bus and took a half hour field trip (there was a sealed road now). The bus broke down only two times on the way, on both occasions quickly fixed. The students, full of enthusiasm, sang and danced in the aisle. 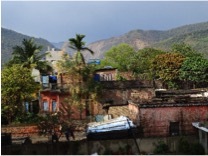 Sunwal, now a town on the East-West highway, had completely transformed, from a place with no shops to dozens. It even had a hall to perform in. And while the students prepared the space for the performance, I went outside. Speaking in Nepali to the oldest person I saw, I told him my story: I lived here 48 years ago. I advised in agriculture. I ate with a family. I don’t remember their name. But the father was the village pandit. “Was it Paudel?” he asked. “Yes!” I said at once. “I think it might have been Paudel.” The man walked up to a younger woman, who took out her cell phone and made a call. The performance started. The troupe entered with a song. The musician played. The actors stood facing the audience while the emcee, or conductor, made an introduction. The playback theatre ritual was underway. Before long audience members were sharing about their everyday, and the performers were playing it back. So far, so good. But would the team, I wondered, be able to motivate and hold the audience as the show progressed? I was curious, since this was my first public performance in Nepal. In playback theatre a common safety valve is that audience members, faced with actors who are not up to understanding or staging the stories, simply stop wanting to tell. The energy shuts down. I would not have been totally surprised to see it happen here. But the tellers kept coming, and as the show went on, the stories grew more revealing rather than less—a definite sign of success. It became apparent that the authenticity of the dialogue facilitators, volunteers from towns just like Sunwal, coupled with their natural human creativity and knowledge of the local culture, helped them fulfill the playback idea and enabled them to carry the event. Behind me there was a commotion. I turned, and there she was, the young mother and maker of my food. She had the same chiseled face, but it held a different kind of beauty now. She was white-haired, as was I. We recognized each other at once. One of the daughters was at her side. She had been less than 10, now almost 60. I recognized her, too. They handed me an exuberance of bougainvillea blossoms plucked from their garden. There was no time to talk. The performance unfolded, as we watched. It was a rare experience watching that show, my hands full of flowers, my faced flushed with emotion because of two people sitting near me that I had never expected to see again. What would have happened if mother Paudel and I had each told a story in that playback theatre performance in Sunwal? Might each of us have been surprised? Might I have ended with more understanding of her situation then? (In fact, since my appearance in Sunwal was the pretext for the performance, the conductor might well have invited us to be tellers, but she did not). I might have learned that this young mother of five resented having to prepare extra meals twice a day at her husband’s orders; or resisted her husband ordering her to restrict the food she gave me, so that they could save more of the money I was paying them; or that she delighted, albeit from her shadow inside the house, in the presence of this exotic stranger. To my surprise, at the end of the performance I was asked to stand up and address the audience. Speaking in a Nepali that seemed to flow from me without hesitation, I said how happy I was to be back in this place that I had lived in almost 50 years ago, and how beautiful the natural surroundings were. And I thanked the Paudel family for taking care of me at that time. Later after a walk to their house (a new structure built on the same land as the old one), we talked. “You were so good with the children,” the (now) grandmother said. (I remembered only my distance from the children). “I told them you would come back one day!” her grandmother said. We were but two small players in a minor international exchange, who had barely interacted. Yet here we were, after so many years, each with such warm feelings for the other. Anne, the instigator, the teacher, the intermediary, looked on happily. Evidently our worlds were not irrevocably divided. Before flying away from the Butwal/Bhairawa region and back to my home I took the opportunity to visit Lumbini, the reputed birthplace of Buddha. Wearing gracefully its centuries of veneration, the renowned Bodhi tree stood serenely in the centre of a large grassy park. Birds sang. The sun shone. Monks in bright orange sat together and prayed. I thought of the stories I had heard—of the power and powerlessness of parents, of obstacles sometimes overcome, but often unsurpassable, of lives cut short and lives allowed to flourish. Of the danger of an orange pip and the promise of a school dress. Of villagers finally accepting a widowed neighbor. Of years passed. And the opportunity we all have. To tell. To listen. And to bring the stories back to tell again wherever we may be on our one earth. Dear Jonathan, thank you for this beautiful and poignant rendering of your reunion visit to Nepal. Reading it and imagining these scenes gives me joy and hope. For me you expressed with clarity and depth the value of connecting across differences in culture, geographical region, religion, race, ethnicity, class, and so much more–which playback theatre does so effectively. I appreciate your framing of the colonialist history and present day in Global South/Global North relationships. And finally, your deep knowing that this is the one earth we all share. A movie would be great, Scottie (they actually did film every moment of this visit, but I don’t know if anything will ever come of it). Thanks for your kind words, and a very big hug from me. So very moving Jonathan to read this tale of origins and return. At the PT Gathering in Hobart recently I told about how Playback came to this part of the world so many years ago, and of the gift you and Jo and Judy and Michael so willingly gave. I feel the blessing of that garland. Lovely to hear from you, Peter. Seeing Facebook photos of the Hobart gathering made me miss you and so many others in your part of the world. Honored is the word that comes to mind. Honored to hear this part of your story, your story within a story, as more stories unfold. Karma, déjà vu, coming full circle; it is all such a wonder. In fact, it practically seems like a miracle to reconnect in Nepal, a country with so many challengesafter a half century has passed. Deep gratitude for sharing who you are and all that you do. Whew! What a ride! Such a wonderfully written journey. It is hard to imagine sometimes the impact we have on others, even as it is easy to feel a hundredfold what we think others feel and think about us. I am reminded of my Indian-Muslim Godmother, whom I can hardly converse with (I am Chinese, and mainly speak English), but the depth of love and connection we have exists lovingly and painfully with the misunderstandings and distance we have with each other. Thanks, Michael. It is one world, eh? And what a blessing to learn this even in one’s own family. I really enjoyed reading this. So many thoughts prompted. I especially like the difference between your 50 yr old memories (presumably much rehearsed) and the contrasting recollections of grandmother Paudel around the same incidents. The past can indeed be re-written. Thanks for sharing your story. Thank you for this story. In my imagination I can see a picture, a monumental work. Love to you, too, Deborah, and looking forward to seeing you later in the year. I’m touched & grateful to have read your Poignant, Painful, Sweet & Satisfying story. Thank you Jonathan. You are a blessing to this world. How touching Jonathan, a magical karmic reconnecting. In many languages and cultures “playback theatre” does not work, or is impossible to translate directly. The Nepali name and what it comes from is so rich as a metaphor. I love it. Absolutely brilliant. What a beautiful tale of a journey taken over 50 years in a visit lasting only a brief time. To have the need and work ethic to see your way back there is remarkable. I see movie… but that’s me.